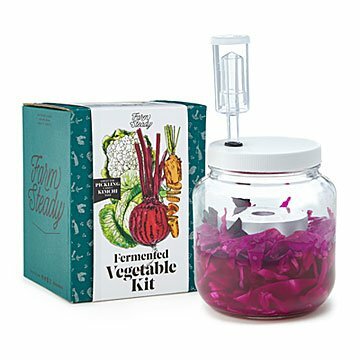 Make your own tasty, healthy fermented veggies with this kit that contains everything you need. You probably thought Mother Nature was done with produce after it's picked. But She pickles it, too—with a little help from you and this DIY kit. To make your own flavor-filled, probiotic-rich pickles, kimchi, kraut, and other delicacies, put fruits and veggies in the jar, submerge them in salted water, and close the airlock lid. In a few days, your crunchy, juicy, fermented treats will be bursting with flavor and gut-healthy probiotics. Besides being good for you, fermentation is one of the oldest forms of food preservation, so you can enjoy your seasonal farmer's market favorites all year long. Thanks, Ma! Assembled in New York. I bought this to try out with my vegetable garden. I can't wait to enjoy my homegrown veggies as a pickled snack.